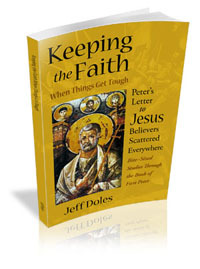 “Do not think it strange,” Peter says to those being persecuted for their faith in Jesus, “as though some strange thing happened to you.” It probably did seem strange to them, and to us, too. Are not believers in Jesus a new kind of people — a chosen generation, a royal priesthood, a holy nation, God’s own special people (1 Peter 2:9)? Does not King Jesus the Messiah, in whom we believe, now rule and reign at the right hand of God (1 Peter 3:22) and does not all glory and dominion belong to Him now and forever (1 Peter 4:11)? How is it, then, that believers must endure such harsh treatment from the world? The outcome for us is assured — God will bring us through — so there is no reason for us to fear persecution. Indeed, Peter finds in it reason for “exceeding joy.” This is the third time he has used the word agalliao, which signifies exuberant rejoicing (see 1 Peter 1:6-8 and A Joy Words Cannot Contain). However, it is not in suffering itself that Peter rejoices, but in what it signifies, for both now and in the future. It shows that when King Jesus returns at the end of the age and His glory is revealed, we shall share in it with Him. The apostle Paul, likewise, speaks of suffering and being glorified together with Jesus. “And if children, then heirs — heirs of God and joint heirs with Christ, if indeed we suffer with Him, that we may also be glorified together” (Romans 8:17). Suffering persecution for Jesus’ sake is also a sign that we are heirs of God and joint heirs with Christ. It shows that the Spirit of glory and of God rests upon us. This is the Spirit of God, the Holy Spirit, but He is also called here the Spirit of Glory. The word “rests” means that He abides with us. He does not come and go, He stays with us. Notice the present tense; not rested or will rest, but the Spirit of Glory rests on us — just as He rested on Jesus. When we are reproached because of our faith in Jesus, it is actually the Holy Spirit who is being dishonored by those who persecute us, while He is honored by our faith and honors us with His presence. He is not just with us but upon us, which means that it becomes evident to us and to others. There is no glory in suffering for being a murderer, a thief, an evildoer or a meddler. These are usually scorned by society, as they were in those days, and rightly so. For the Gentiles, however, believers in Jesus belonged in the same category and were called “Christians” as a term of derision. But what the world treats shamefully, Peter takes as honor: When you are reproached for the name of Christ and called “Christian,” do not take that as a badge of disgrace but as an opportunity to give thanks to God. This was not just theory for Peter. He lived it. When he and some of the other apostles were brought before the Sanhedrin and admonished for preaching Jesus, Peter answered, “We ought to obey God rather then men.” On advice from Gamaliel that this movement would probably come to nothing, the council released Peter and the apostles. “So they departed from the presence of the council, rejoicing that they were counted worthy to suffer shame for His name. And daily in the temple, and in every house, they did not cease teaching and preaching Jesus as the Christ” (Acts 5:41-42).